As part of my project to bring our central heating into the 21st century I have been working on a custom wireless sensor platform. My key aim here is to develop a low-cost, open solution with security designed in from the start; something that a lot of sub-GHz protocols seem to totally omit. I’m avoiding ZigBee because, as much as I want to like it, I keep coming back to the issue that its complexity just pushes up the system cost. In a domestic environment a simple sub-GHz solution can easily cover a typical property without resorting to meshing. The design I have gone for combines temperature and light sensing with a pulse input for connection to the gas and electricity meters. The microcontroller is an ATMEGA328 and the radio is a Hope RF RFM23B, which is based on a SiLabs Si4431. This is a synthesised transceiver so the potential for congestion can be avoided through the use of listen-before-talk and frequency hopping, the latter also offering a way around the duty cycle restrictions in the 868 MHz band. The printed antenna needs to be tuned by trimming it to length, which will no doubt be the subject of a future post. Once the optimal dimensions have been determined this can be applied to any future spin of the boards in advance. No prizes for spotting the deliberate mistake with the microstrip track passing under the RF module – I am hopeful it won’t have too great an effect! The boards in the photograph just came back from iTeadStudio in about a fortnight. The quality is absolutely excellent considering the <£10 price tag for the 10 circuits. I have loaded a couple and firmware development is in progress. This entry was posted in 8-Bit, Embedded, Home Automation, RF on November 20, 2012 by Mike. 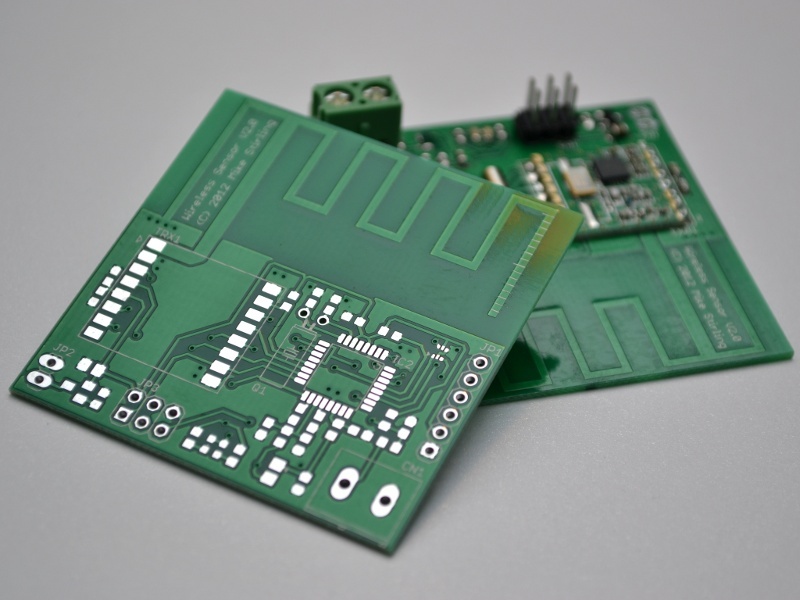 looks like great board quality:-) Will you be posting the schematic and design files? Hi. Yes I was impressed with the quality given the price. I have subsequently had a second set back from Seeedstudio (same price, so I was hedging my bets) and they were equally as good. I haven’t decided on publishing the design yet, but in all likelihood I will once I am happy with it. Hi Mike, Just come across your site while fishing for info on wireless TRVs. I am encouraged that someone is making progress in the UK (my German is non existent). Have you looked at the Si1000 based wireless modules such as the Hope-RFM50/RFsolutions-Zulu which provides the wireless and microcontroller in one package? I’m surprised you consider duty cycle might be a problem, won’t you want to keep transmission as short and infrequent as possible in a battery operated device? Thanks for the tip on iTead too. I am tempted to try them out although it does mean I’ll have to get to grips with board design, I assume you use Eagle? I did a fairly comprehensive study of various options, initially intending to do a discrete solution (as opposed to using an RF module). As well as the SiLabs devices I also looked at the TI (Chipcon) range plus a few others. In general I found that a separate MCU gave more flexibility and in most cases worked out cheaper or at least comparable. The Si1003 was on my hit-list, though, and I wasn’t aware of the RFM50 module which does actually work out quite cost-effective, especially considering it is the larger Si1000. I will take a look at it so thanks for the heads up. Duty cycle is more of a consideration for the bridge/coordinator, which will have to transmit much more frequently where there are control nodes in the system as well as sensors (which is the plan). I do agree that it is unlikely to be a problem for most domestic applications though. On the TRV side I now have working code to run Conrad FHT valves from an RFM22/23 module. I guess maybe you spotted this on the OpenTRV site? It’s looking unlikely I will get anything installed here before the end of this winter, so I might also look at the Sparmatic Comet with a view to adding a radio and customising the firmware. This would have the advantage of better integration (and security; the Conrad valves are wide open), and they are also half the price.